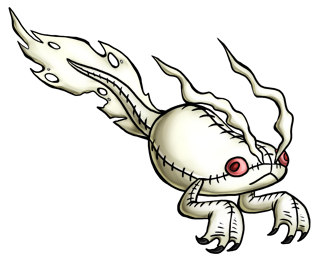 Its spooky countenance and ability to seemingly vanish into nothing would appear to vindicate folklore that its wild forbearers were restless spirits that took physical form as Kreatures. In reality it is merely bending the light around its body to turn invisible. Its venom has antibacterial qualities and was used as an ingredient in sorcerers' potions. It has a good appetite and is extremely hardy, able to survive in stagnant water that would choke out other aquatic Kreatures; therefore it is a popular choice among novice Kreature Tamers. Basing the Spectad on the tadpoles of Albino Clawed Frogs is simply great. The stitch-like patterns on it and its meta-form was another great choice! !